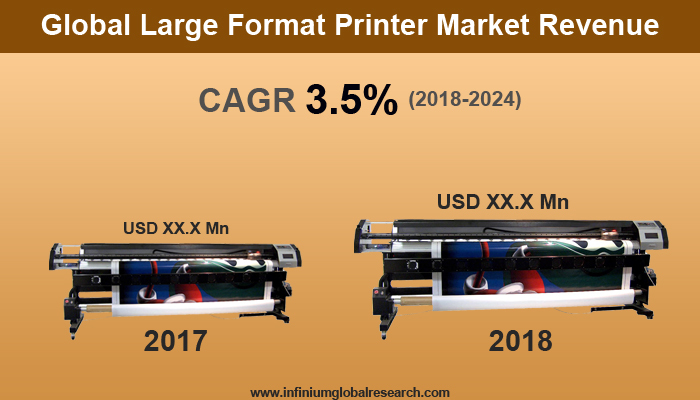 A recent report published by Infinium Global Research on large format printer market provides in depth analysis of segments and sub-segments in global as well as regional markets of large format printer market. The study also highlights the impact of drivers, restraints and macro indicators on the global and regional markets of large format printer over the short term as well as long term. The report is a comprehensive presentation of trends, forecast and dollar values of global large format printer market. According to report the global large format printer market is projected to grow at a CAGR of 3.5% over the forecast period of 2018 - 2024. The growing demand for large format printing in textile and packaging industries is the factor driving the growth of the market. Additionally, adoption of UV-curable inks is also expected to be the factor driving the growth of the market as UV curing offers efficient curing of inks using high-intensity UV light. However, high initial investments and operating costs may restrain the growth of the market. Moreover, Benefits such as high-quality output, energy efficiency and less wastage have made 3D printers preferred among end-users in comparison to traditional 2D printing. Hence, advancements in technologies such as selective laser sintering and fuel deposition modelling are providing growth opportunities for the key players in the large format printer market. The report on global large format printer market covers segments such as ink type, offering, printing technology, and application. The ink type segments include UV-cured ink, latex ink, aqueous ink, dye sublimation ink and solvent ink. On the basis of offering the global large format printer market is categorized into after-sales services, printers and RIP software. Furthermore, on the basis of printing technology the large format printer market is segmented as ink-based (inkjet) printers and toner-based (laser) printers. On the basis of application the large format printer market is segmented as apparel & textile, advertising, cad and technical printing, signage and decor. The report provides profiles of the companies in the global large format printer market such as, Durst Phototechnik, Canon, Ricoh, Konica Minolta, Mimaki Engineering, Electronics for Imaging, Hewlett-Packard, Kyocera, Agfa-Gevaert, and Xerox. The report provides deep insights on demand forecasts, market trends and micro and macro indicators. In addition, this report provides insights on the factors that are driving and restraining the global large format printer market. Moreover, IGR-Growth Matrix analysis given in the report brings an insight on the investment areas that existing or new market players can consider. The report provides insights into the market using analytical tools such as Porter’s five forces analysis and DRO analysis of large format printer market. Moreover, the study highlights current market trends and provides forecast from 2018 to 2024. We also have highlighted future trends in the large format printer market that will impact the demand during the forecast period. Moreover, the competitive analysis given in each regional market brings an insight on the market share of the leading players. Additionally, the analysis highlights rise and fall in the market shares of the key players in the market. This report will help manufacturers, suppliers and distributors of the large format printer market to understand the present and future trends in this market and formulate their strategies accordingly.